Organized around "The Canticle of the Creatures" by St. Francis of Assisi, Water, Wind, Earth, and Fire is the first book to consider the ways in which praying with the natural elements can enliven Christian spiritual life. Teacher, artist, and Benedictine oblate Christine Valters Paintner offers concrete suggestions and guided contemplative exercises; for instance, she suggests that readers take time to "watch the sunrise or sunset and breathe in the beauty of the fiery sky. Contemplate what those beginnings and endings have to say in your own life." Readers benefit from Paintner's extensive training in theology and Benedictine spirituality, as well as her unique work in bringing the expressive arts to spiritual direction. Spirituality and Practice has named Water, Wind, Earth, and Fire one of the best spiritual books of 2010! As a journalist, I see thousands of new books on religion and spirituality flowing from publishers every year and a huge portion of those books relate to prayer, which is the most widespread religious expression in the world. Prayer is a practice, or rather a wide array of practices, extending to us from the roots of human civilization thousands of years ago. Often, we forget the richness of our own traditions, even the specific Christian tradition that most Americans share. Often, helpful guides can emerge to reconnect us with themes and creative ideas that can wake up our prayer life–and can connect us with parts of the world we often overlook. Right now, millions of Americans are waking up to their deep connection with the natural world. For a long time, American evangelical movements were so focused on the “next” world that this one was almost an afterthought. Where does our faith connect with “Creation care”? That’s a two-word phrase now popular among religious environmental activists. For thousands of years, this wasn’t even a question. Religion and environment always intertwined. Remember that the roots of our spiritual traditions lie in ancient lands where life depended on the weather, the fertility of fields–and the overall balance of non-human life on Earth. In the past 500 years, in particular, the Western Christian world seems to have lost track of this connection. It doesn’t take a rocket scientist to figure out that St. Francis of Assisi’s “Canticle of the Creatures” (also known as the “Canticle of the Sun”) is a powerful and poetic evocation of God’s presence in the elements of nature. But few Christians, in my experience, seem to draw the connection that if the elements are indeed agents of God’s blessings and means by which we can offer blessing and worship back to God, then it might make sense to think in terms of “air prayer,” “water prayer,” and so forth. This is the simple yet powerful premise of this lovely new book from Christine Valter Paintner, a Benedictine Oblate and the founder of the Abbey of the Arts website which explores the connection between spirituality and creativity. Some of my readers may wonder if this is a crypto-Wiccan book, and indeed anyone interested in creative cross-fertilization between Neopaganism and Christian spirituality will find much to explore in this book. But let’s be clear: the four elements (air, fire, water and earth) are universal energies, since they are grounded not only in the nature of the earth, but indeed in our very bodies (think of it: your skeleton and flesh are earth, your blood is water, your lungs and breath bring you air, and the very heat your body generates is the fire within you). Historically speaking, knowledge of the four elements and exploration of their spiritual meaning can be traced back to Greece, where Plato speaks of the elements, following the earlier Sicilian philosopher Empedocles. In other words, our earliest knowledge of the elements is not occult or magical, but rather philosophical and scientific, in scope. For Christians today, befriending the four elements is a way to honor the incarnational dimension of our faith, seeing God’s presence in nature just as we believe the Holy Spirit and the Mind of Christ is present among those who are knit into the community of faith. Water, Wind, Earth & Fire is essentially a workbook (“playbook”?) for prayer, divided into sections where Valters Paintner explores each element through poetry, stories, blessings, quotations, lectio divina, and suggestions for prayer and reflection. Most of the connections she highlights are obvious enough: water is linked to baptism, air to centering prayer, earth to feasting. This is not a book of secrets revealed so much as earthy common sense: water goes with the flow, fire brings passion and creativity, earth stabilizes and grounds us. Weave all four elements together and we find balance, perspective, and a sense of being at home in the good universe God has given us. Paintner then transitions into the guided retreat part of her book. Author Carl McColman refers to Water, Wind, Earth And Fire as a “workbook . . . for prayer.” I believe this is an accurate portrayal. 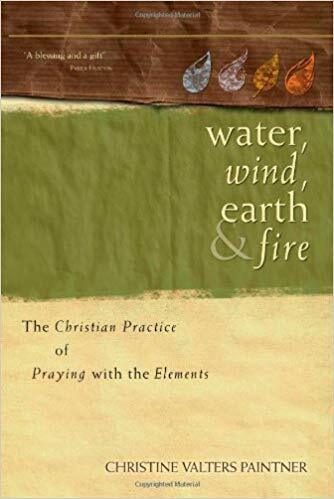 Water, Wind, Earth And Fire is brimming with encouragement to spend time in prayer and worship, practical suggestions for enhancing personal devotional times, and compelling “reflection” questions. Paintner introduces specific practices and concepts which some folks – like myself – may not be familiar with including Lectio Divina, St. Ignatius’ Exercises and Examen, the “Jesus Prayer” or “Prayer of the Heart,” and centering prayer. Paintner also presents passage meditation, yoga, and “body prayer” as helpful exercises for spiritual growth. Remarkably, Paintner doesn’t get too bogged down with the details of these practices, just offers them as potential resources and keeps moving right along. I believe this approach enhanced the book’s accessibility and will permit appreciation from a wide audience. The structure of Water, Wind, Earth And Fire is tight and consistent; it allows the reader to relax into the material and focus on the elements, prayer, and reflection. Paintner begins each chapter with an excerpt from the “Canticle of the Creatures” and a Celtic Prayer. She then introduces an element, shares quotes from Scripture and saints, and identifies the chapter’s themes. For instance, “Brother Wind” isn’t just a chapter about the vague characteristics of wind, but about wind “as life-breath, as inspiration, as directional force by allowing yourself to be carried where the wind blows, as powerful sacred presence in the midst of the whirlwind and storms of life, and as the current that lifts your wings in flight” (18). Paintner’s own reflections – which are just personal enough without too much self-disclosure – are bolstered by Scripture and quotes from poets, contemplatives and saints. Paintner then offers reflection questions and practical ways to incorporate awareness of the element into prayer and devotional life. Every chapter ends with guidelines for Lectio Divina and a prayer, both of which felt like gifts to me. Even if I couldn’t go for a walk in the woods or light a candle at my altar, I could allow the prayer to wash over me and bring me rest right in that moment.